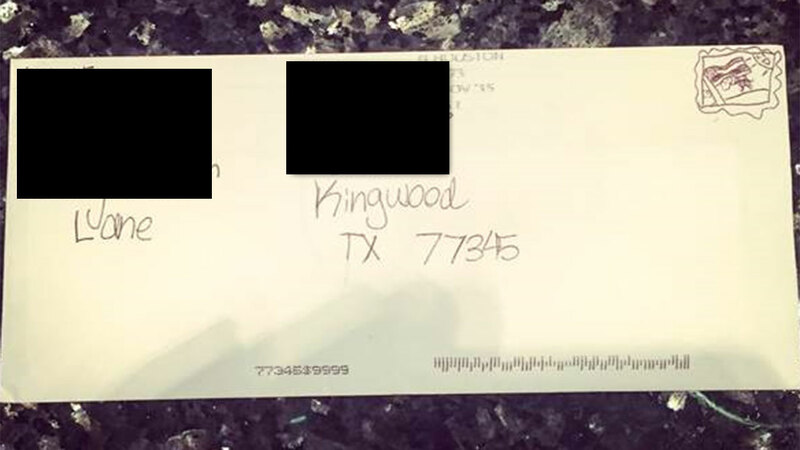 The drawn-on stamp got the letter from Sugar Land to Kingwood. HOUSTON -- Thanksgiving came early for a Houston-area family who received an unexpected treat from an unlikely source -- the U.S. Postal Service. It all started when eight-year-old Tristyn Hendricks wanted to send her dad a letter. Tristyn lives in Sugar Land with her mom, Jeni, and sees her dad every other weekend. Trystan wrote her dad the letter, but didn't have a stamp. Tristyn wasn't deterre. She used her budding artistic skills to draw a stamp on the envelope and asked her mom if they could mail it. "I dismissively said yes, certain it would find its way right back to our home due to lack of proper postage," Jeni Hendricks said. But Tristyn was in for big surprise. A week later, her dad, Bobby, sent a text message with a picture of the letter which had been delivered to his home in Kingwood. Jenni was ecstatic, "I just wanted to high five our USPS for truly going above and beyond by mailing a simple sweet letter from a little girl to her Daddy," she said. "What an example of kindness, especially in today's world." The United States Postal Service delivered a letter without a stamp to a girl's father just before Thanksgiving. Am 8-year-old's letter to her dad was delivered by USPS without a stamp.